Asota heliconia came a visiting inside our home! 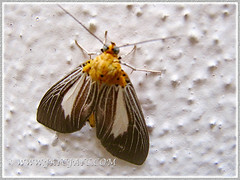 John and I always get so excited when we noticed a moth or butterfly inside our home or outside at our front yard. 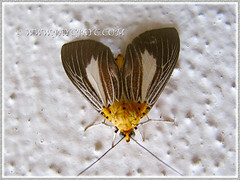 Recently, a gorgeous looking moth came a visiting inside our home and especially delighted me so. I was dancing with joy and amazement, so to speak as I observed it from time to time, as it displayed itself high up the kitchen wall surface. Probably, it could have been attracted by the kitchen light and flew inside. This beauty was a silent immobile resident in our home for three full days and nights. It was not deterred at all by our presence as we go about our chores in the kitchen. Even though I had to climb up a ladder to reach it and held my camera just a couple of inches away as I delightfully took numerous shots, it remained motionless and unnerved. Such courage! Finally on the fourth morning, I shifted it to our courtyard and hoped that it’ll be happier there. Noticed that by early afternoon it had flown away. Good-bye and thank you, Asota heliconia for gracing our home with your presence. This beautiful moth has forewings with a narrow central white wedge that is surrounded in dark greyish-brown. The white hindwings are also bordered greyish-brown. 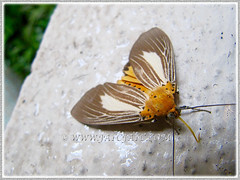 Both forewings and hindwing have white vein-like markings. The aedeagus vesicle has two cornet at the apex of one lobe. The underside is similar to the upper surface. Besides, it has an orange colour head and thorax with several black spots on the thorax. The upper side of thorax is hairy. 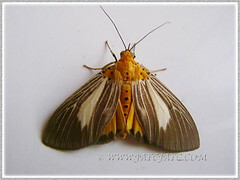 The body is a contrasting orangy-yellow with several black spots. The wingspan is 52-60 mm wide. World Distribution: Indo-Australian tropics east to Queensland and the Solomons. Also, found in south-east Asia, including Malaysia, Borneo, Thailand, Hong Kong and the Philippines. Habitat: Abundant in the lowlands and secondary forest areas. Also, in small numbers from altitudes up to 1900 m.
Food plants: Larva feeds mainly on the young leaves of the Averrhoa species, especially the Averrhoa bilimbi (Belimbing Asam in Malay) that is noted as its host-plant. Insect Pollinators (butterflies and bees) invading our garden! Catopsilia pomona pomona, a pale-yellow polymorphic butterfly!